Today is Gavin’s birthday ~ what a day to celebrate! Six years? How is that possible? That is when I first became a grandparent. Time flies and the days get richer! Gavin wanted garden plants for his birthday. 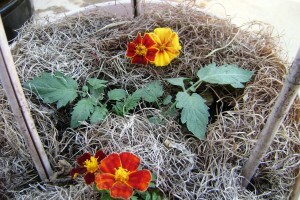 His mom specified that they should come in a pot that he could tend to himself (as I did not raise a gardener in Steph…yet). Well, how could I refuse that? Gav is my garden helper. He plants and waters and listens to everything I tell him about growing things. Flowers are OK to him, but veggies (especially tomatoes!) are better: truly a man after my own heart. So, last week on a beautiful, sunny day, we took Gavin to my favorite garden center just outside town (Horiuchi Brothers Nursery – great stuff and generous-they always give me free stuff!). Gavin was so excited as we were turning into their drive. He told us, “My mom and dad never take me to the garden center. I always want to go here, but they say, “No – let’s just go to church. '” Hahhahahhha! I hope he is not somehow equating a passionate indulgence in gardening as a sin or some opposition to good church-going folk?? Anyhow-he’d have turned his entire backyard into the garden of Eden if I hadn’t made him choose just a few favorites!I ended up with a bunch of specialty pepper plants in my own 4 x 4 because he just had to grow them! Oh the miles of smiles you’ve brought me, Gavin! You are my heart’s joy and delight! You opened the door that turned me into a Nonna! You are exuberance and curiosity. You are a good-finder and glee. Your love and zeal for all things family and gardening and learning at school and Wii and Xbox and cartoons (especially Spongebob) and your sisters and cousins and building and running and jumping and playing? Inspires me! I want to enjoy life like you do! 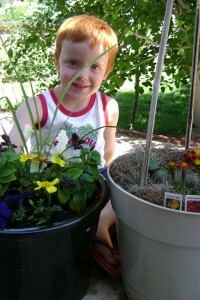 pictured: Gavin with his 2 birthday pots; a pot of flowers for the front porch (marigolds, purple petunias, purple salvia and white wave petunias which will soon cascade down the side of the black Malaysian pot; a grape tomato plant for the patio with a couple of marigolds to keep it company. Happy happy birthday to my oldest child! You changed my life 6 years ago, and I love you oh so much! You are the best big brother in the world, and your two little sisters are so blessed to have you looking out for them. I am so glad that your little red head came into the world and led the way for the next generation of the Lord’s warriors. I enjoyed your Birthday letter to Gavin. 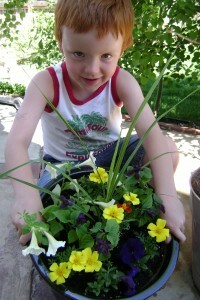 I propose that he will grow up and have a whoppin’ business…in Flowers and Plants…..in his own Garden Center. Sweet and he’s got the best of teachers. Tell him if he ever hits it big – he has to have you as his manager!